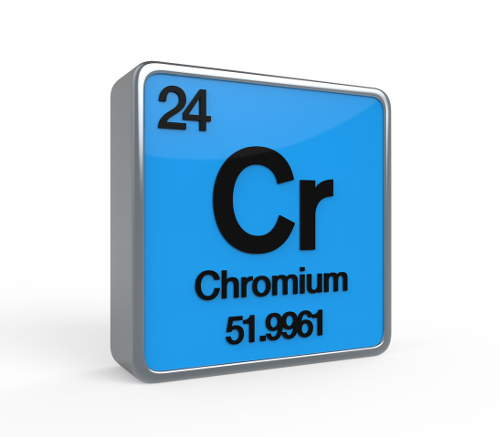 You may know chromium as that chemical element sandwiched between vanadium and manganese on the periodic table. It is a hard and brittle metal and a trace mineral that the body needs in small amounts to function at its best. There are two types: the biologically active type found in foods called trivalent (chromium 3+) and the toxic and unsafe type used in industrial applications called hexavalent (chromium 6+). Some of the most well-researched health benefits of dietary chromium include brain health, heart health, diabetes control, weight management, and boosting energy and metabolism. It has a role in insulin-signaling pathways, which allows the body to control the sugar it takes in, and therefore, will balance blood glucose levels and stabilize energy. Other research shows that chromium may help protect DNA chromosomes from damage, which may prevent mutations that result in various chronic diseases. Read on to discover why we need to eat chromium foods, how much we need, and whether or not it is safe to supplement with it. Chromium deficiency is not very common in the U.S. and other developed nations since enough is often obtained daily in the diet. One of the reasons Americans get enough is that it is present in whole wheat bread and cereals, which are common in the standard American diet. Some researchers believe chromium deficiency is more prevalent, especially in people that fail to respond to insulin. This is much of the population that eats a poor diet and is overweight. Diabetics and the elderly are more prone to deficiency than children or otherwise healthy adults. What are the health benefits of chromium? We need it for brain health, heart health, weight management, energy, and blood sugar control, just to name a few. It is also necessary for skin health since blood sugar changes are linked with skin problems like acne. Chromium is also beneficial for age-related eye disorders like glaucoma, and eye disorders related to diabetes. Since it slows calcium loss, it may also prevent bone loss and bone-related disorders common in older women. The following is a detailed description of some of the key chromium benefits. Chromium helps enhance the critical hormone that controls blood sugar called insulin. The mineral also helps bring glucose into cells where it is used for energy. A study published in the journal Diabetes in 1997 found that insulin and cholesterol levels significantly decreased when given chromium supplements compared to a placebo group. The study participants continued to take medications and their regular eating habits over the course of the four-month study. Other studies show that chromium does not strongly control blood sugar in diabetics when the supplement is not combined with other treatments. It is also worth noting though that brewer’s yeast, a high chromium food, has been found to prevent insulin resistance, glucose intolerance, and diabetes formation. Our bodies require chromium for fat metabolism, including cholesterol. Research shows a connection between healthy arteries and blood cholesterol levels with a higher intake of this mineral. Lower levels are also seen in people that die from heart disease. A study published in the Western Journal of Medicine in 1990 found that chromium supplementation in adults over a 42-day period reduced total cholesterol and LDL (low-density lipoprotein) cholesterol compared with the placebo group. Chromium in the form of chromium picolinate has an association with reduced risk of obesity and less weight gain. Some studies find that a higher intake has a link with better-controlled eating and a reduction of fat accumulation in the body. A study published in the journal Diabetes Technology & Therapeutics in 2008 suggested that 1,000 milligrams of chromium picolinate regulated food intake in 42 overweight women that reported carbohydrate cravings. The women also experienced fewer fat cravings, reduced hunger, and a decrease in body weight. Healthy insulin response is necessary for brain health and cognitive function in old age. Since chromium can improve insulin response and glucose levels, it may benefit brain function and reduce age-related alterations in the brain. Chromium has an association with healthy functioning in the hypothalamus of the brain—a central part of the autonomic nervous system that helps control thirst, hunger, body temperature, emotions, and sleep. Research indicates that it helps keep the hypothalamus in a youthful state, while regulating appetite in the elderly, and preventing negative effects on neurons of the brain. Getting enough trace minerals is especially important for active individuals. Micronutrients are needed to boost energy and increase the capacity of muscle performance. Chromium-rich foods are needed to help a person’s metabolism, especially when they restrict body weight from exercising and eating less food. These foods will help offset the loss of the mineral excreted in sweat and extra urine due to recovery after exercise. According to the Institute of Medicine at the National Academy of Sciences, the following is the recommended dietary reference intake for chromium daily for people that are otherwise healthy. Your exact needs may differ based on your current weight, health, and level of activity. Keep in mind that more may be needed to help people control blood sugar, especially those with diabetes or mild to severe insulin resistance. Many nutrition experts recommend 200 micrograms (mcg) daily in a high-quality multi-vitamin/mineral formula. In some cases, high doses up to 1,000 micrograms are necessary for type 2 diabetics or metabolic syndrome patients. Unfortunately, there isn’t a reliable database of chromium food sources authorized by the USDA (United States Department of Agriculture) or other credible authorities. It is also difficult to know the best food sources because the content will vary widely within a certain food depending on where it was grown. Soil quality has a great deal to do with how much is present, as it is stored in rocks and soil, and penetrates the crops. Other factors that affect chromium’s presence include the time of year the food was grown, how long the food sits after being harvested, the exact plant species, the ripeness of the food, and the possible contamination from the environment. It’s content can also increase when it leaks into food while cooking with nickel or stainless steel pots and pans. There are also small amounts in the water we drink. With that said, the USDA does provide some foods that help you obtain more chromium naturally in the diet. It is naturally present in whole foods like vegetables, certain types of meats, whole grains, and brewer’s yeast. The following is a chromium foods chart that is a useful tool for learning what foods can help you avoid a deficiency. The chart will allow you to become aware of what whole foods contain the highest amount. Should You Supplement with Chromium? Since some studies show mixed results, the benefits of taking chromium supplements are somewhat controversial. Supplements containing this mineral may include chromium polynicotinate, chromium picolinate, and other related types. You can purchase it in capsule or tablet form, or part of a multi-vitamin and mineral supplement. However, since we only really require a small amount, and most people get enough in the diet, supplementation often isn’t necessary for most adults. Since researchers still find it hard to verify the specific role of chromium in the body, the health community cannot agree whether it should be taken regularly or not. In other words, it isn’t clear whether other minerals or substances need it to carry out certain jobs in the body. As a result, many nutrition experts believe food is a healthier way to obtain it. Also, sometimes these supplements can be expensive, and may prevent some people from taking them on a regular basis. This article does a good job of detailing the health benefits of chromium, especially when we get it in the diet. However, are there potential risks with consuming too much? Most research shows that it is safe in moderate amounts, although too much can lead to toxicity and some severe side effects. With that said, overdoses are rare since it will enter cells in small amounts, and the rest will get flushed from the body. When you get too much chromium, likely from supplements and not food, it can potentially lead to DNA damage after entering the cells. So, it is important not to take more than the recommended daily dose. It is best to get enough of it and other nutrients from whole foods to help ensure you get the right mix of minerals and vitamins with risking overdoing any nutrient. Taking high amounts of chromium supplements may interact with some medications, and worsen certain health conditions. Too much of this mineral sometimes has an association with digestive problems and low blood sugar levels. Toxicity can also cause damage to vital organs like the heart, kidneys, and liver. Although unlikely to happen and very rare, toxicity can change the heartbeat and nerve signaling. Always consult with a doctor before taking high doses of any supplement, including chromium. Mateljan, G., The World’s Healthiest Foods: Essential Guide for the healthiest way of eating (Seattle: George Mateljan Foundation), 790-791. “Chromium,” Dr. Weil; https://www.drweil.com/vitamins-supplements-herbs/supplements-remedies/chromium/, last accessed May 31, 2017. “Chromium,” National Institutes of Health, November 4, 2013; https://ods.od.nih.gov/factsheets/Chromium-HealthProfessional/. McCarty, M.F., “Longevity effect of chromium picolinate—‘rejuvenation’ of hypothalamic function?” Medical Hypotheses, October 1994; 43(4): 253-265. https://www.ncbi.nlm.nih.gov/pubmed/7838011. Anton, S.D., et al., “Effects of chromium picolinate on food intake and satiety,” Diabetes Technology & Therapeutics, October 2008; 10(5): 405-412, doi: 10.1089/dia.2007.0292. Press, R.I., et al., “The effect of chromium picolinate on serum cholesterol and apolipoprotein fractions in human subjects,” Western Journal of Medicine, January 1990; 152(1): 41-45. https://www.ncbi.nlm.nih.gov/pmc/articles/PMC1002252/. Anderson, R.A., et al., “Elevated intakes of supplemental chromium improve glucose and insulin variables in individuals with type 2 diabetes,” Diabetes, November 1997; 46(11): 1786-1791. https://www.ncbi.nlm.nih.gov/pubmed/9356027.